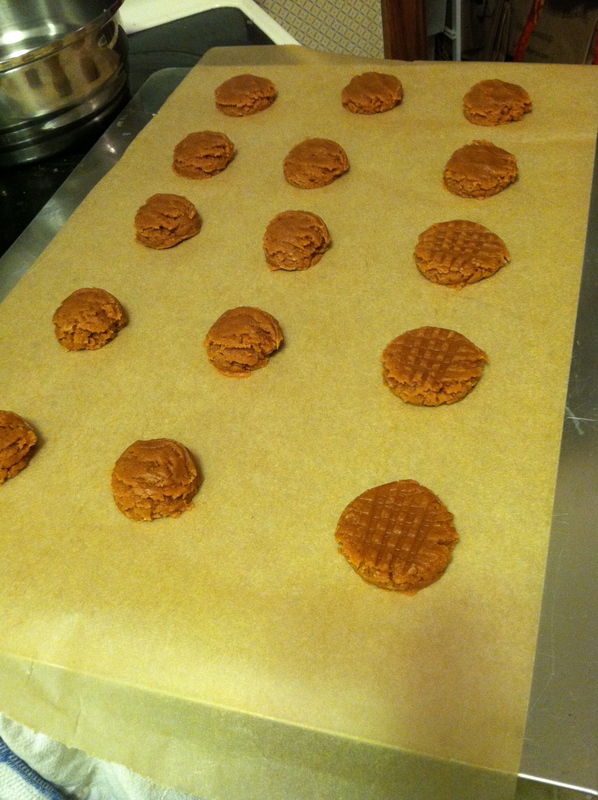 Lightly Sweetened Peanut Butter Cookies: Just in time for the holidays! Hello friends! Christmas is upon us! Merry Christmas and Happy Holidays to you and the ones you love! As I write, I have a beautiful fragrant Christmas tree lit up in my living room and Christmas music playing in the background. I got to thinking about Christmas cookies and wanted to share a recipe with you the way I like to bake: lightly sweetened (reduced/low sugar). Nervous if you will enjoy a cookie with not as much sweetness? Read on. If you are just stopping by for the recipe and not further information on reduced sugar baking and how I came to bake this way, scroll right to the bottom of the post. I am not sure if it is the amount of years I have had diabetes (25 years in February, 2012) or the age I currently am, (36), but cane sugar and I are just not pals anymore. This includes white granulated sugar at the top of my list, but also powdered sugar and brown sugar. Throw a “bakery baked” full sugar pastry, cake, cookie or whatever in front of me, and if I eat it, my blood sugar can raise 100-200 points within 30 minutes to 1 hour. I’m talking 250’s – 300’s (100 mg/dL is normal) here no problem! As I have grown older, married a husband I adore and want to grow old in years with, my focus on good self care has really intensified. The temporary satisfaction I receive from eating sweets is just not worth the possible near and long term complications of diabetes. This is not to say I never indulge in a sweet but I try to eat most of my baked goods in the form of reduced sugar ones that I bake myself. Keep in mind this is easier for me because I am on a gluten and corn free diet. The majority of sweets we are surrounded and constantly bombarded by – I cannot consume! I am also not able to eat over 1/2 of the gluten free bakery items available because of my corn allergy as typical baking powder has corn starch in it. Am I now just more aware that my sugars are getting high after eating sugary confections, or am I really reacting more severely to cane sugar? Perhaps a little of both. I am not sure quite how long (2-3 years?) it has been now that I have worn a Dexcom CGM (Continuous Glucose Monitor), but it really helps me be in tune with exactly what is happening to my blood sugars with every event in my life. Over the last few years I have been experimenting more with alternate sweeteners and seeing what kind of effect they have on my blood sugars. Baking has been a passion of mine since I was a child and it was not something I wanted to give up. I have found consumption of alternative sugars vs. cane sugar dramatically helps me avoid rapid hyperglycemic excursions (high blood sugars). Alternative sugars can include: Agave, Maple Syrup, Honey, Stevia, Coconut Palm Sugar and Dates & Date Sugar. Stevia is a natural herb and I love using it to sweeten my foods while having no upward effect on my blood sugars. This is the first Stevia product I bought at my local Co-op, and I love it. It also does not have the adverse effects associated with it like Aspartame (NutraSweet) or Splenda. 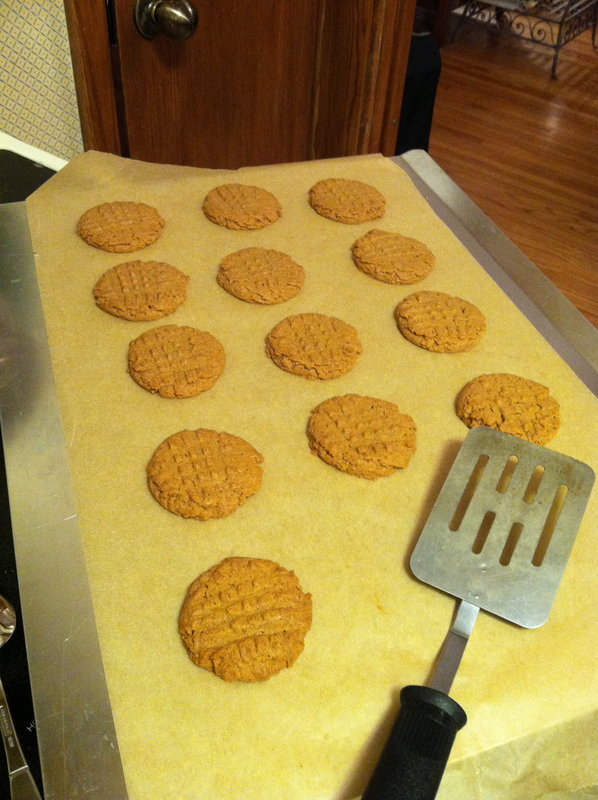 This recipe for peanut butter cookies features palm sugar (which has 1/2 the glycemic index of cane sugar and also less than agave & honey) and Stevia. I love that palm sugar does not have the overly sweet taste that white sugar does. If you do not currently have these ingredients in your kitchen, regular white sugar will suffice. One thing to keep in mind is most of us are eating WAY too much sugar. Whether living with diabetes or not, sugar is not good for any of us. Did you know that on average Americans are swallowing 22 teaspoons of sugar each day!!! Most of it coming from soda and candy. Here is a link to an article discussing this unhealthy trend among Americans and an article the New York Times featured on the toxicity of sugar. I have been doing all my baking with approximately 1/2 the sugar the recipe calls for since starting to bake after diagnosis at age 11. A recent victory for me was when my husband Jaim came home and reported that he had eaten some cake at a work function that day. When I asked how it was, his response was, “It was WAY too sweet, not very good.” Hearing this was music to my ears. He can take down or shall I say “inhale” a dessert like nobody’s business. Just ask his Dad sometime to tell you some stories of Jaim and his love affair with sweets that started as a very young boy. Let me just share one story of Jaim from childhood that makes me smile every time I hear it. Growing up, his mother Nancy lovingly made homemade chocolate covered cherries for her husband Chan for special occasions; they were his favorite. Once when Jaim was 4-5 years old and playing downstairs, he looked up and there was a whole tray of chocolate covered cherries in front of his eyes! Nancy had put them down there to cool. Jaim simply took one and ate it. Right off the middle of the baking sheet, not trying to be discreet or hide his consumption at all! We all love that story of our sweet Jaim. Here is the recipe and what you came for! I originally got this recipe this off the Whole Foods Market web site featuring a woman making these cookies in a video. They are naturally gluten free as they do not contain flour. The recipe below is an adjustment from the original recipe making it reduced/low sugar. You may use Peanut Butter if you do not have a peanut allergy. I have an allergy to most nuts including peanuts, but thankfully not almonds! 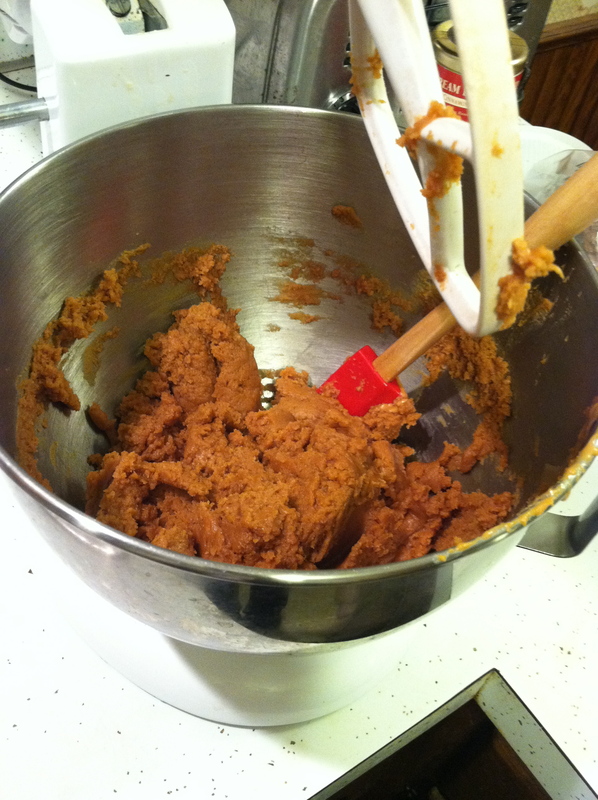 I substituted Barney Butter (made with almonds) in this recipe for the peanut butter. They turned out great. As the original recipe features peanut butter, there are no worries that the recipe will turn out if made with peanut butter and not Barney Butter. Barney Butter is made to taste more like regular peanut butter and is in my opinion far superior in taste to regular almond butter. I found it at my local Whole Foods store but you can order it online by clicking on the link. It does have added sugar (to give it more of a peanut buttery taste) but I have not noticed an impact on my blood sugars. Preheat your oven to 350 degrees. Place a sheet of parchment paper on a large cookie sheet. 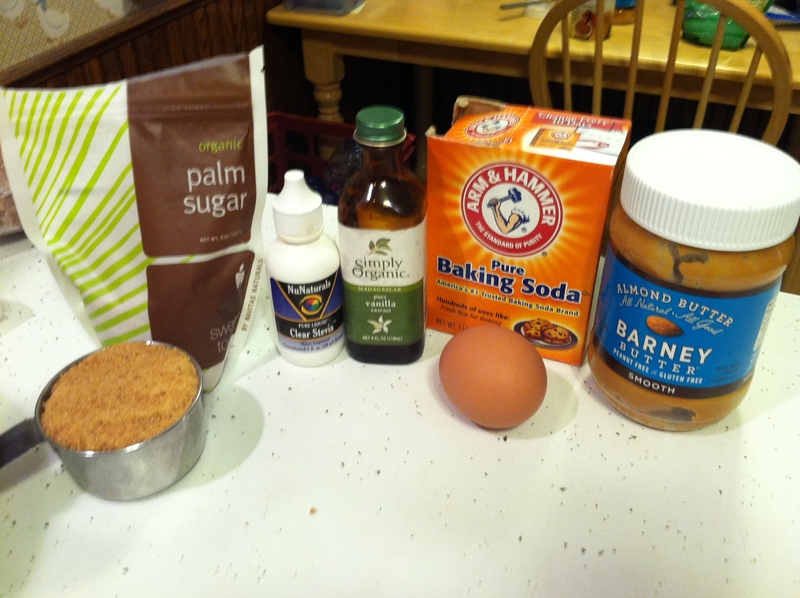 Put into bowl: egg, sugar, stevia (if using), baking soda, peanut butter and vanilla. Mix well. If desired, fold in chocolate chips. Place teaspoon sized mounds on baking sheet and make criss-cross shapes with the back of a fork. Bake for 10-12 minutes depending on desired texture and firmness of cookie. Remember they may be slightly soft when removing from oven but they firm up as they cool. Let cool and eat! I hope you enjoy this recipe and that it is a positive experience for you with a lightly sweetened treat. Surprise someone with diabetes in your life by presenting them with a wrapped gift of these “healthier” Christmas cookies that came straight from the heart. Remember you may need to watch how your blood sugar responds before bolusing the amount of insulin you would for a typical cookie. I am hoping you will need less insulin and have much happier blood sugars! Enjoy! We love comments and feedback! Please leave a comment below sharing your thoughts on reduced sugar baking and any experience you have with alternative sweeteners. How do your blood sugars respond to a “bakery baked” full sugar pastry, cake or cookie? Please join us on our Facebook page for Diabetes Light! Come to learn, be inspired & experience community + find out when new articles post!! Coconut Oil may help my Diabetes?? You mean you can teach an “Old Dog” new tricks?!??!? Grrr. (Not okay!) & Thank you!! Energy bars: delicious & diabetes-friendly! This seems like an easy recipe to follow and enjoy,especially at Holiday parties that include diabetics. I sounds just as good for non-diabetics as well! Personally, I don’t eat much sweet baked goods,however I like a whole-wheat bagel now & then.Some people say that they just eat whatever is at a table to avoid any feelings of appearing “different”. They think they can just allow for the treat by bolusing later with insulin. Sometimes this can work, but not for everybody. i also liked the “Personal touches” you added about your years and age of onset. Great info Cynthia, and look forward to reading (and learning) more! Oh, and make sure you keep an eye on your husband if there’s any chocolate-covered cherries at the next party you attend! Thanks John for your comment! The people that can get away with sweets not effecting their blood sugars too much are lucky! Fortunately for the rest of us – there are recipes that taste great and have less sugar. Thanks for the laugh – I’ll keep Jaim away from the cherries! YUMMY!! I’m just now sitting down to my computer since before Christmas Eve and checked out your blog post. Yum. Yum. Yum. Looks delish! I’m going to try these (I hope soon!). Thanks Leah for your comment and taking a look at the recipe I posted! I hope you enjoy them as much as we do! Let me know how they turn out and if you are able to decrease the sugar, how that turns out for you! Good web site! I really love how it is easy on my eyes it is. I’m wondering how I might be notified when a new post has been made. I’ve subscribed to your feed which may do the trick? Have a nice day! Kenneth, Thank you for reading. Yes, with my feed you should receive notification of new posts. I have also added a new feature on the blog. If you go to the home page on http://www.diabeteslight.com, you will see a ‘follow’ link – type your information in here to be notified as well. Also, are you on Facebook? Diabetes Light is on Facebook – please come on over and join our community by ‘liking’ our page. Along with posting a link to my latest articles, I also share an inspirational quote every morning and other tidbits too. Let me know if you have any more questions! Thanks again! NOTE: I AM NOT INTERESTED IN ADVERTISEMENTS ON MY BLOG. DO NOT LEAVE A COMMENT JUST TO PROVIDE YOUR LINK. THANK YOU. This sounds great! I’m actually not allergic to peanuts, but saw your comment about Barney Butter. We have an almond nut butter here in the UK and it beats peanut butter hands down on taste! Nutritionally too, I am led to believe. Thanks for the recipe!